Accommodation Chania - in the Country - from each of these locations you can explore the region of Chania with all its beauty and diversity. From beaches to mountains, country villages, gorges and the cosmopolitan corners of the old zone in town, you will find your days full of wonder in this stunning region of Crete. 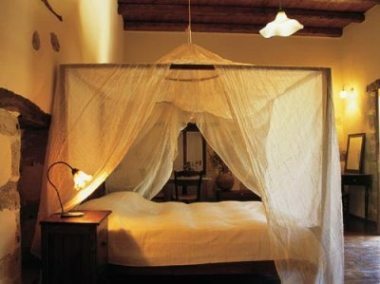 Accommodation Chania - Kastellos is located in a picturesque semi-mountainous village 50 km from Chania Town. 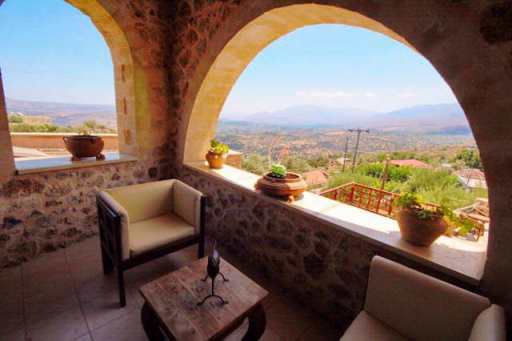 With sweeping views to the sea, part of this traditional hilltop village has been restored to provide an elegant yet rustic accommodation experience, very close to the beautiful inland Lake Kournas. This is where the real character of Crete can be found, in the small villages amongst the olive groves and surrounded by stories of bravery and rebellion. With three separate hamlets, each with four restored stone village houses, this is a place to relax and enjoy mountain air and tranquility. The houses harmoniously combine traditional style with modern decorative elements, creating a warm and cozy atmosphere. Each house has two floors with a private veranda with panoramic view of the mountains and the sea. Choose from houses with one or two sitting areas. All houses have a fully-equipped kitchen, bathroom with bathtub, toilet and shower and in the bedrooms, king size beds. All houses have airconditioning, a fireplace and plasma television. The houses can accommodate 4 to 6 guests. Each hamlet has two swimming pools, one for adults and one for children and a dedicated parking area. 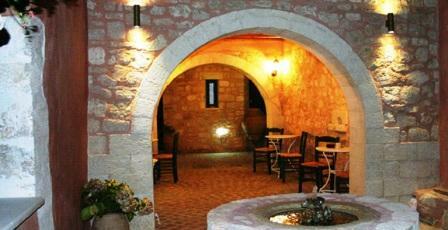 At the centre of Kastellos Village Hotel is the reception area and a traditional Greek coffee house. 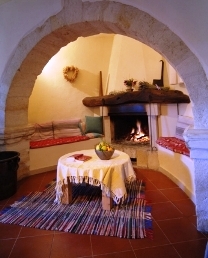 This is a special place with a guesthouse, therapeutic spa and a separate villa to offer the weary traveller. A wonderful choice for your holiday in Crete. 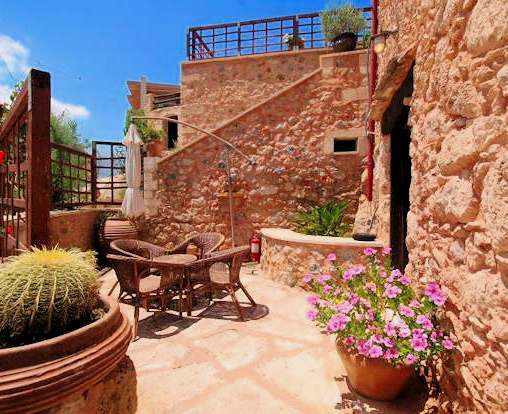 Located just inland from the town of Kissamos, the Elia Guesthouse is 25 km from Chania Town. Sitting in rolling olive groves just outside of the village of Ano Vouves, the 200 year old restored farmhouse and estate offers a view to the Mediterranean, beautiful gardens, paths and courtyards and relaxing country walks. The nine apartments Almond-Tree, Chamomile, Pomegranate-Tree and Grapevine, are perfect for a cozy stay. Wholesome traditional food is served and adds to the therapies on offer such as massage, reiki, yoga, beauty treatments and revitalising baths. A unique Chania hotel. 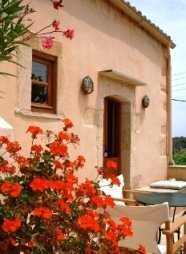 Accommodation Chania - this beautiful rural accommodation in Crete is chosen for its authentic architecture and small size, it is a peaceful rustic getaway for a real experience of Kríti. This community is also dedicated to sharing a real grass-roots environmental retreat, using organic farming and solar energy. 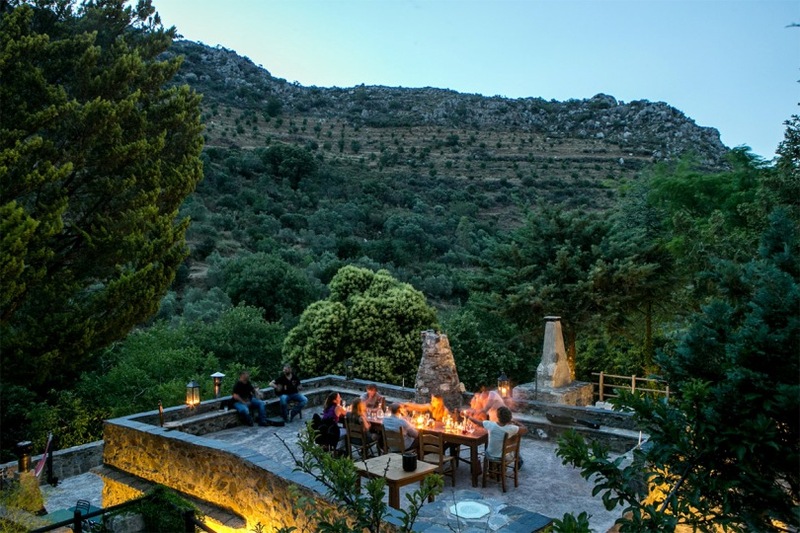 Located 60 km from Chania town in the west of the island, the Eco Village Miliá Μηλιά is a fully restored village built into the rocks of the beautiful Cretan mountains. The closest village is Vlatos 4km away. Central to the scenic area of western Crete, the retreat itself persuades visitors to relax, breathe deeply and be at one with nature. 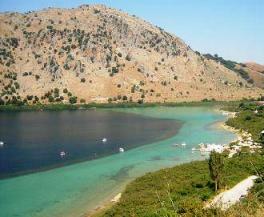 Close by are the beautiful beaches of Elafonisi and Paleochora to the south and Falasarna and Gramvousa to the north. Under 20 rooms or 'room houses' are offered, each one is unique. All are lovingly restored and simple. Candles are used at night. Time slows down. All houses have central heating, a fireplace or a wood stove for wintertime, en suite bathrooms, balconies, patios or roof-terraces. The 120 hectares of Miliá offer plenty of walks and nature to explore. 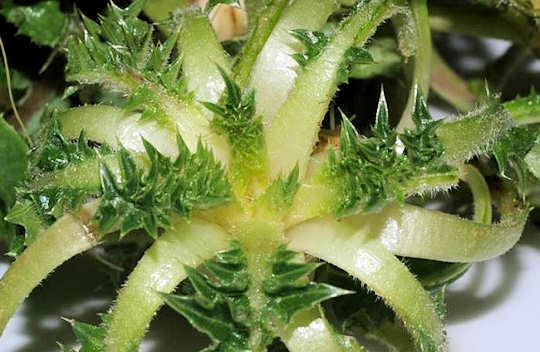 There are chestnut trees, plane trees, acorn trees and cone-bearing trees, and aromatic herbs, various flower-bearing bushes, olive trees, pear and wild pear, and carob trees. The rare vulture Gypaetus barbatus, the Bearded Vulture known for eating bones, lives in the area. The organic gardens and many village buildings offer farm activities to those guests who choose to get really involved with the local produce, which is then served at the warm, family-like kitchen for guests of Miliá. Traditional wholesome fare is served according to the rhythms of nature. Dishes offered could be rabbit with mizithra cheese baked in the oven; potato, chestnut and onion stew; pork with orange cooked in the woodstove; boureki zucchini and potato with mizithra cheese; or kalitsounia small cheese pies. Contact Tassos at Miliá if you have any questions before booking your peaceful retreat. 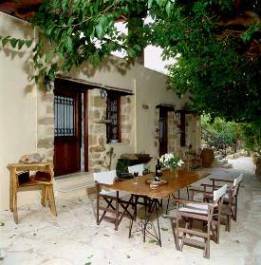 Accommodation Chania - just 45 minutes from Chania International Airport in the charming countryside of Crete is a small village named Samonas. 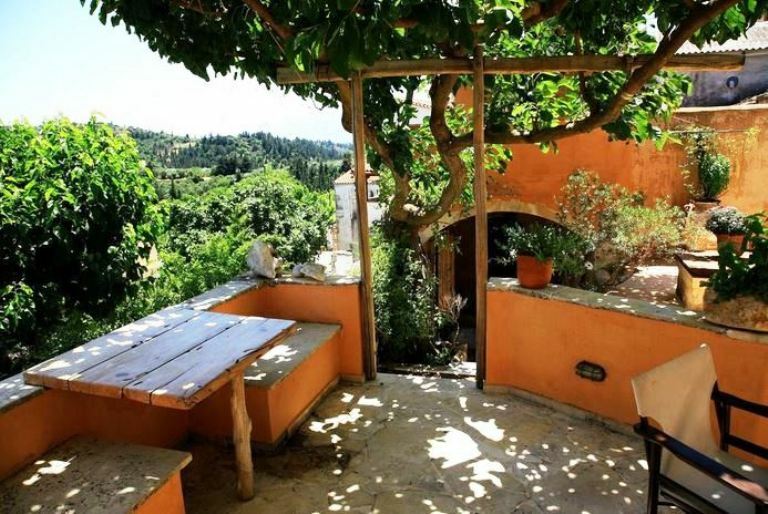 This village sits on a rise, overlooking rolling hills of olive groves to the sea and has stunning mountain views as well. This hill top village has been described as an eyrie, it certainly has a beautiful aspect, where some of the more elevated traditional village homes have been restored and augmented to create superb quality modern villas. Reflecting the local architecture, the villas are made of stone and wood in the local style, with verandas and extra higher levels to take advantage of the expansive views. Ideally located in the centre of Chania province, this is a quiet rural getaway with five villas accommodating four guests each, showing individual characteristics of the previous use of each building such as wine store or stables. The Aetifolia Taverna (Eagle’s Nest) in this village, is well known locally for its traditional fresh food – international visitors love it for its authenticity and fantastic views. Konstantinos and Eva will welcome you with open hearts and true Cretan hospitality to Samonas Traditional Villas, helping with packed lunches and local knowledge, directions to the beach (12 km) and to Chania town (25 km). If you want a string of tavernas, don’t come here. If you want nightclubs and bars and ‘doof doof’ music, don’t come here. If you want to breathe fresh air, relax and experience the real Crete, this is a great choice of accommodation in western Crete. Great home-cooked breakfasts too! Accommodation Chania - Kamares Καμάρες Houses. Located in the hills and sweeping valley in the village of Machairoi, the Kamares Houses are 23 km from Chania and 40 km from Rethymnon on the island of Crete in Greece. Kamares Houses are in a beautifully restored Venetian monastery in the traditional village of Mahairoi, full of Cretan history and character, in an area of natural beauty. The restoration has combined traditional architecture and modern quality facilities. 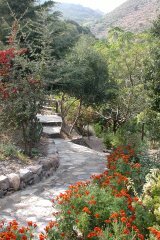 Such a small and beautiful retreat is perfect for sanctuary in the hills of Kriti. The furniture in Kamares was designed by your host Roula, following patterns from the local museum of folklore. Each piece has been hand made by local craftsmen of cypress wood, marble and iron. Your host Kostas has hand-forged the iron work and grown the cypress in his family’s woodland. For each of these Chania hotel locations it is probably best to book a rent a car. Chania based pickups available - pick up and drop off at the airport or city centre.. Choose your quiet country getaway by location on the map below. For destinations in the west of Crete, such as Chania and Rethymnon, use Chania International Airport CHQ, for the central and eastern destinations, use Heraklion International Airport HER.